We are well into the throes of winter now. The holidays are over , the trees are bare and the landscape is barren and in my humble opinion, rather dismal. I’m a warm weather sunshine girl and so now it’s the long, slow countdown until Spring for me. We have two more holidays upcoming before Spring and those are Valentine’s day and St. Patrick’s day. After that I really start counting the days until Springtime! I have thus far been taking my two mile walk every morning right up until it was 16 degrees when I left the house in the morning. I didn’t think it prudent to walk outside then so I have been using my trusty treadmill. Not my favorite way to get exercise but it gets the job done. I am also busy knitting and doing other odds and ends. Please remember to look out for the people you care about during these cold months. Make sure they are warm and have company to pass the winter months. Talk to them, take them a book or a puzzle anything to let them know you are thinking of them and that you care. Don’t forget the strangers either! Leave a warm hat or scarf outside where someone in need can access it. I hope you all enjoyed a lovely holiday season with people you love and care about. I think this newsletter has lots of good material in it and I hope you can all put it to good use. 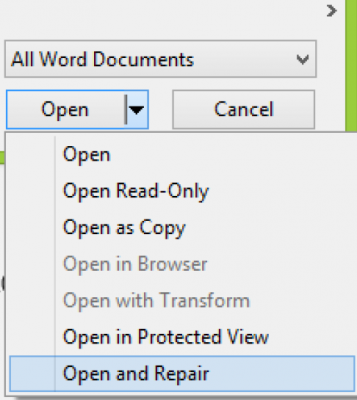 If you are experiencing difficulty when trying to open a Word document, most likely the reason is that the document has been somehow corrupted. It doesn’t happen often, but it can happen. The good news is that you may still be able to recover your document. Click on File | Open | Browse. Select the document you are having difficulty with. If you are then able to successfully open your document, you should then copy the entire document and paste it into a new document and save it. If you want to have a “clean” document that is not bloated and that behaves nicely and does what you want it to do, then you need to know how to use Breaks in your word documents. It allows you to increase your productivity. Not only that, but you can prepare and print documents with stop and start text entry at specific places in your documents. Many times I receive e-mails from subscribers asking me how to use both Portrait and Landscape in one document. The answer is simple – utilize Breaks! Select the Layout tab of your Ribbon. Click the drop-down next to Breaks. Your cursor will be moved to a new page, which will permit you to apply different attributes to this page, such as Landscape or Portrait, letter or legal, etc. You can now modify this specific page without affecting the format of the other pages in your document. Turns a big problem into something easy peasy!